Founded in 1823, Brownsville, Tennessee, is the seat of Haywood County, an area flush with cotton farms. Brownsville’s economy was long based on the staple, even as sharecropper shacks replaced slave quarters on plantations throughout West Tennessee. With the coming of the railroad, Brownsville solidified its status as a commercial cotton trading hub between the larger cities of Memphis and Jackson, Tennessee. Three families have long dominated Jewish life in Brownsville. The story of the Jewish community of Brownsville is replete with Felsenthals, Tamms, and Sternbergers, from their arrival in Brownsville as German Jewish immigrants in the 19th century, to the fifth generation descendants today who keep the eternal light burning in one of the South’s most historic and beautiful synagogues. The earliest Jewish settler in Brownsville was Jacob Felsenthal, who came to the United States in 1840. He settled in Brownsville in 1847, opening a retail store. Jacob was the acorn from which the Brownsville Jewish community grew. He soon brought over four of his younger siblings from Bavaria. Two of his brothers fought for the Confederacy, serving in Nathan Bedford Forrest’s cavalry. 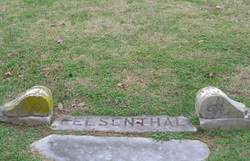 One of them, Isaac Felsenthal, was killed at the Battle of Shiloh. Joseph Felsenthal began his life in America as a peddler, before joining his brother’s business. Jacob and Joseph remained in Brownsville during the Civil War and tried to keep the business afloat. They suffered economic privation along with the rest of the town. After the war, the Felsenthal Brothers contacted their creditors, and rather than asking for debt relief, requested additional credit to purchase merchandise. Correctly anticipating the economic boom of the New South, they were able to pay all of their debts within five years. Jacob Felsenthal became quite wealthy. In 1860, he owned $800 in real estate and $2300 in personal wealth. By 1870, he owned $8000 in real estate and $4000 in personal wealth. Joseph also became rich. Their store, J. Felsenthal and Brothers, was one of the oldest family-owned businesses in the state, and remained in its original location in downtown Brownsville until it closed in 1974. Emil Tamm was an observant Jew from Bavaria. Although he had studied to be a rabbi, Tamm chose a different course for his life when he turned 20, immigrating to the United States in 1867. After spending two years in Chicago, Tamm decided to move to Brownsville, where two of his distant relatives, Mayer Greenwald and Seligman Anker, already lived. Tamm opened a general merchandise store, which remained in business for over a century. Tamm married Seligman’s daughter, Hannah Anker, and together they raised nine children, only four of whom remained in Brownsville as adults. Tamm’s store became a family business, as three of his sons and his son-in-law, Fred Silverstein, became partners. The E. Tamm & Sons Department Store remained in the Tamm and Silverstein families until it closed in the 1970s. Emil Tamm became a leading citizen in Brownsville, actively participating in civic and political affairs. Tamm was a loyal and influential member of the state Democratic Party. When he died in 1906, the local newspaper called him “one of the most reliable and substantial businessmen” in town. Jacob and Joseph Sternberger came to Brownsville from Bavaria in the early 1860s. Joseph came first in 1860, with his brother Jacob arriving four years later. The brothers opened a grocery store, and later moved into dry goods. Before leaving for America, Joseph’s father had given him a Torah to bring with him, to ensure that he would remain religiously observant. This Torah was one of the first to arrive in the state of Tennessee, and would help to organize the Brownsville Jewish community. In 1866, local Jews first met together to worship in Joseph Sternberger’s home. In 1867, the growing community founded a congregation, Adas Israel. The group initially met in private homes, including that of Jacob Felsenthal. They also met in rooms above stores owned by the Anker and Rothschild families. During its early years, Isaac Levi served as lay reader, as the congregation worshiped in the Orthodox manner. When Levi died in 1869, his place was taken by Emil Tamm, who was able to use the rabbinic training he had received in Bavaria. A Sisterhood was founded in 1873. During the 1870s, the small congregation gradually moved toward Reform Judaism, under the leadership of Tamm, who also served as president of the congregation. 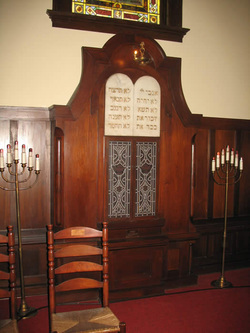 In 1879, Adas Israel formally moved away from traditional practice, writing in its bylaws that “the mode of worship shall be that of reformed Judaism.” Tamm credited this change with bringing “new life” to the congregation as “our young folks began to appreciate the beauties of our hymns and prayers.” This change reflected the rapid assimilation of Brownsville Jews, as did a new provision in the bylaws which allowed Jews with Gentile spouses to join the congregation as long as they certified in a legal document that they would raise their children as Jewish. Brownsville’s Jewish community was growing in the 1870s, largely due to the fertility of these early families. While there were only a handful of Jewish families by 1880, most of them had many children. The need to pass down Judaism to this younger generation prompted the maturation of Brownsville’s congregation. In 1878, the group purchased land for a burial ground that is still in use today. 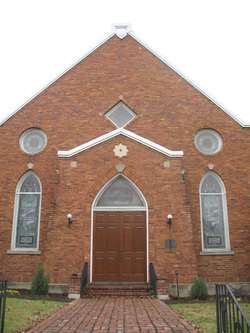 In 1882, the 25-member congregation constructed a synagogue. Built out of wood and modeled after the United Hebrew Congregation temple in Louisville, Kentucky, Adas Israel’s new home reflected the congregation’s recent embrace of Reform Judaism. It included a loft in the back of the sanctuary with an organ and seating for a choir. Despite their official embrace of Reform Judaism in 1879, Adas Israel did not join the Union of American Hebrew Congregations until 1922. The building was dedicated in a large public ceremony led by Rabbi Max Samfield of Memphis’ Reform congregation. Members of the congregation, led by the children in the religious school, marched with their two Torahs from the old meeting place to their new permanent synagogue. According to the local newspaper account, “the new temple was filled to overflowing with Jewish members and…a host of non-Jewish worshipers and supporters from every religious denomination in the city.” The crowd overwhelmed the 200-seat sanctuary, and overflowed onto the lawn outside. Reverend Harris of the local Methodist Church was a special guest and sat on the bimah. Over the years, Adas Israel’s synagogue has been altered, including the installation of 13 magnificent stained glass windows, which remain the temple’s most striking feature today. In 1922, a brick veneer was added to the building, and the choir loft was taken down and replaced by two religious school rooms. The synagogue still stands today, and is the oldest Jewish house of worship remaining in Tennessee. Adas Israel never had a full-time rabbi. A series of lay leaders conducted services, often serving long tenures. Emil Tamm led services for 38 years, until his death in 1907. Abe Sternberger, Joseph Sternberger’s son, led services from 1909 until 1931, when he moved to Memphis. Morton Felsenthal led services from 1936 to 1982. Fred Silverstein, the great grandson of Emil Tamm, took over after Felsenthal’s death. Today, Fred Silverstein, Jr. often leads services for the small congregation. The Brownsville Jewish community peaked in the early 1890s, when an estimated 200 Jews lived in town. The economic depression of the 1890s took its toll on Brownsville and the Jewish population, which had declined by half by the turn of the century. This decline was not offset by an influx of new Jewish immigrants from Eastern Europe, unlike many other Southern communities. Indeed, Brownsville’s Jewish community was dominated by German Jews, with the Eastern European wave having little impact. Of the 68 foreign-born people buried in the Brownsville cemetery, 52 were from Germany. This was unusual since in many other Tennessee towns Eastern European Jews outnumbered the Germans. By 1937, 60 Jews lived in Brownsville. After World War II, Haywood County began to see some industrial development, and the Jewish community experienced a small resurgence. In 1963, Adas Israel had sixteen member families. Most of these Jews owned retail stores, although two, Bubba Marks and Henry Levy, were farmers. A few local Jews were also cotton buyers. Fred Silverstein, a descendant of Emil Tamm, took over the E. Tamm & Sons Department Store in 1964, and ran the business until it closed in the 1970s. During the Civil Rights Movement, Brownsville was wracked by conflict, which sometimes touched the small local Jewish population. In one of the era’s most infamous episodes, local white landowners, under pressure from the White Citizen’s Council, evicted their black sharecroppers in response to their calls for voting rights. Many of these now homeless black families took up residence in a tent city on a local black landowner’s property. Some lived in the tent city for over a year, which became a national news story. Henry Levy had been raised in Kentucky, and moved to Brownsville after he married Louise Sternberger. Levy did not accept the status quo of white supremacy. When the local Citizen’s Council demanded that Levy fire his workers who belonged to the NAACP, he refused. Facing death threats, Levy became a pariah in the white community, and was refused credit at the local bank. Despite this pressure, Levy continued to support the displaced sharecroppers, and even allowed civil rights groups to meet at his home. As a plant and flower farmer, Levy was more insulated from economic pressures to conform than Jewish store owners. While the Civil Rights Movement changed the region politically and socially, farm mechanization transformed it economically. Bubba Marks was one of the earliest owners of a mechanical cotton picker in the county, a machine which revolutionized the economy of the cotton South. The rise of the mechanical picker led to a sharp decline in the local farmer and sharecropper population, the very people who had been patrons of Brownsville’s downtown stores, like Tamm’s. The arrival of retailing juggernaut Walmart put additional economic pressure on Jewish-owned stores in Brownsville. The result was the closing of several Jewish-owned businesses that had supported the Jewish community for over a century. This led to a steep drop in the number of Jews living in Brownsville, as many children raised there moved away to larger cities. Several moved to nearby Memphis and Nashville. In 1975, 45 Jews lived in town; today, only six Jews remain. Despite these declining numbers, Adas Israel remained active. In the late 1970s, the congregation reestablished a small religious school with five students. Once these students graduated and left Brownsville, the school became defunct. During the 1980s, the congregation experienced a drop in activity, and regular services were discontinued. In 1990, an exchange student from Israel helped to get the congregation jump started, leading Friday night services for the remaining Jews in town. After the student left, the congregation has continued on its own. Adas Israel currently holds Friday night services once a month. After a short service, a guest speaker addresses an audience that includes several non-Jews. One Jewish child lives in Brownsville, who travels to nearby Jackson for religious school. Through all of the ups and downs of Brownsville’s Jewish community, some things remained remarkably consistent. In 1967, all of the congregation’s officers were either Felsenthals, Sternbergers, or Silversteins (descendants of the Tamm family), the same families which had established the congregation a century earlier. Today, descendants of the Tamm and Sternberger families lead the monthly services in the 126-year-old synagogue that still serves as the home of Adas Israel.